Prague, the capital of Czech Republic, is a charming city for the perfect European vacation. With all that old world charm oozing from it’s gothic structures and the vibrant hip flowing through it’s night life scenes, Praha, as the locals call it is the city that will bring you your holiday high! Festive season or not, this city always carries a cheerful vibe! When you start exploring, you’ll have a lot to fall in love with and nothing but the lack of time on your trip to complain about. For those intending to enjoy a touristy trip to Prague, here’s how you can explore this beautiful city in 3 whole days. Prague is divided into 12 zones. Praha 1 and 2 have most tourist attractions in the vicinity. Knowing this could be helpful in choosing your stay. To start with, buy yourself a Prague City Card. This means- free unlimited city transport, free entry to museums and monuments, discounts at restaurants, souvenirs. You may not be a fan of tour guides and their version of story telling. But there’s no better way to start exploring a city like Prague than with a free walking tour. Every morning at 10am, many groups provide free walking tours from the Charles Bridge and the Old Town Square. These tours last for 2hours and are free of charge. It’s up to you to tip your guide. Just look out for groups with yellow/blue umbrellas. The Old Town Square is one of the most popular squares in Prague with the Wenceslas Square on one side and The Charles Bridge on another. This square is the center to some of the most historic statues and structures in Czech Republic- the Old Town Hall, Jan Hus Memorial, The Church of St. Nicholas and the Astronomical Clock, oldest active astronomical clock in the world. The Astronomical Clock particularly attracts a lot of attention amongst tourists, with its popular hourly displays and the legends that surround it. Towards December, the Old Town Square becomes even more vibrant with the Christmas Markets; it is the biggest and most visited in Czech Republic. The Charles Bridge is a 14th century bridge that originally connected the Prague Castle and the Old Town of Prague. This bridge was built in the regime of King Charles IV and was the only means of crossing the Vlatva River. What makes this bridge special is the presence of over 30 baroque style statues, mostly of patrons and saints across the 621m long bridge. The original statues have been places in the National Museum and what take their place are systematic replicas. The Charles Bridge is not just one of the best spots to view both the sunrise and the sunset, it is also a popular tourist hub with millions of tourists crossing the bridge everyday. What’s special about this bridge other than the scenic views? It’s the whole bunch of street artists and musicians that you encounter on the way that truly make this an experience to remember! 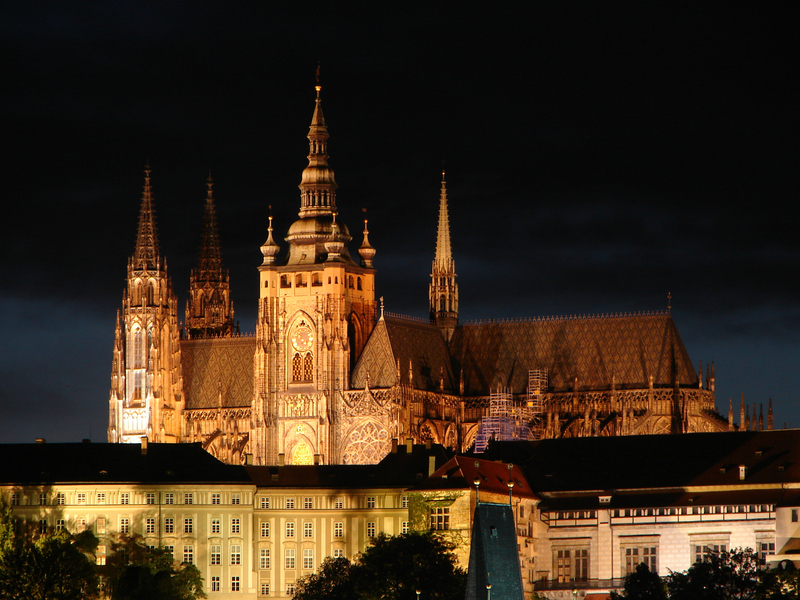 The historic Prague Castle is beyond any ordinary castle. It is the largest ancient castle as per the Guinness Book Of World Records. This 9th century castle complex has been home to some of the most powerful empires in Czech including Bohemians, Holy Romans, Czechoslovakian kings. Today it is the home to the President of Czech Republic and one of the most tourist savvy spots in the city. When in Czech, eat like the Czechs! Roasted Duck, chicken and fish along with some local wine is just the perfect Czech meal to blend in with the Czech food flavors! Here’s your guide to restaurant’s in Prague. For the best view of Praha, the park of Letna Hill is one of the best spots to relax and take pictures. Climbing up hill could take a while, but the view is absolutely worth the efforts! It is also where Legendary Pop star Michael Jackson started his HIStory World Tour in the September of 1996! Cemetry has been a burial ground for some of the most famous Czech people. A walk by the riverside at Vyšehrad at the sunset time is one of the most recommended things on your Prague-To Do-List! For lovers of literatures and fans of one of the most celebrated Czech writer- Franz Kafka can visit his museum, the Kafka Museum in Praha 1 which exhibits his works, letters and some really interesting statues that catch your eye. The vibrant and lively side of Prague comes alive when the lights go out! Prague has too many Pub Crawl groups and tours to take you along some of its coolest bars trying out the best of beers, wines and others! 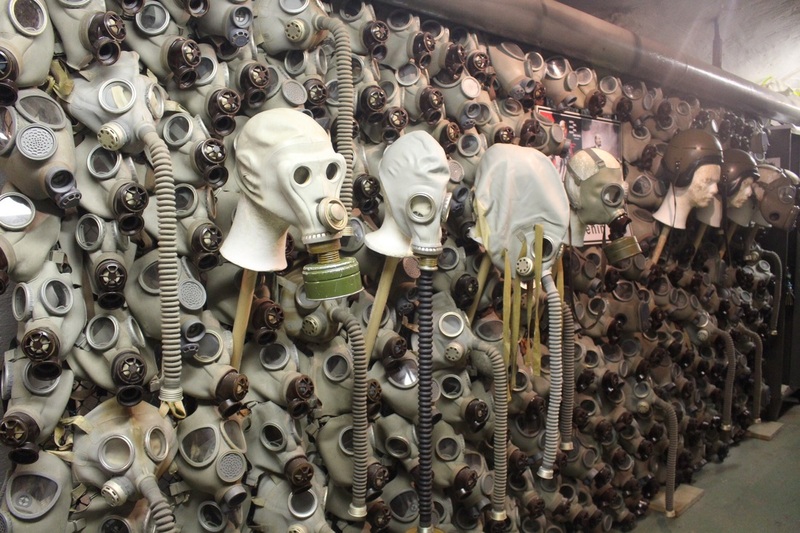 You can opt for Nuclear Bunker Tour, which cannot be done without a guided tour. Don’t worry; this guided tour will surely be memorable as you go 5 storeys underground to see the effects of the Cold War and the dreadful historic past that this city has witnessed! The Nuclear Bunker Tour will give you the perfect feel of the past and promises to send a chill down the spine! After witnessing the horrid scenes of the past, it could be some relief to visit the John Lennon Wall. It is also known as the Peace Wall, which is filled with graffiti and the lyrics of the songs by Beatles. Over the years, it became a medium for the youth to voice their opinion against communism and spread the message of peace! The Clementium has a long history of it’s own of it’s transition to becoming the National Library of Prague. But for book lovers, it’s most important aspect is that it is a book heaven- a baroque style library with the old world charm and thousands and lacs of books in the background! There’s no stopping the night in Prague! You could repeat a pub cawl, or visit some cool clubs like Roxy, Chapeau Rogue which make excellent Saturday Night hangout spots in the city! Travelling to Prague has some additional benefits. It’s not only the capital of Czech Republic but also towards the center. Which means you can explore most of Czech Republic by keeping Praha as your centre. Almost all major Czech towns can be reached from Prague by Cesky Drahy in a span of 2-3hrs. Towns like Telc, Litmosyl are small enough to be covered in a daylong trip. You can also read about our trip to Karlovy Vary, Litomysl, Telc, Cesky Krumlov from Prague.